"I love the bold taste of Vietnamese dishes. This is packed with flavor and spice and is just beautiful in colors. I have tried doing individual bowls but prefer a family-style serving. Serve with a quality jasmine rice and spring roll for additional savory awesomeness. Add a little sliced habanero pepper if you want to increase the heat level. (I'm from Texas and like heat.)" Cut cabbage in half on a flat work surface. Empty one half of the core and most of the interior leaves to act as a bowl. Slice the other half thinly. Finely chop 1/2 the red onion and slice the other half thinly. Heat 1 tablespoon canola oil in a large skillet over medium heat. Add the chopped onion, ground beef, Fresno chile, paprika, and salt. Cook, breaking up and stirring occasionally, until beef is browned and crumbly, 5 to 7 minutes. Whisk remaining oil, lime juice, fish sauce, brown sugar, and lime zest together in a small bowl. Stir into the beef mixture and combine thoroughly. Scoop the heated mixture into the cabbage bowl. 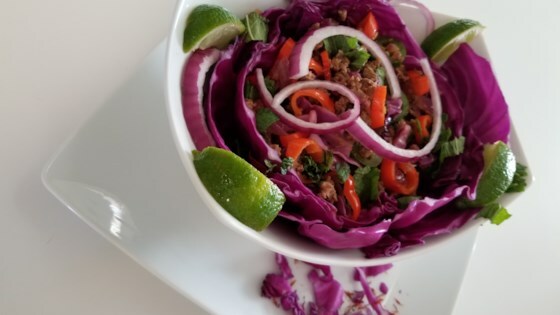 Top with the sliced cabbage, sliced onion, cilantro, and mint. Serve with lime wedges.